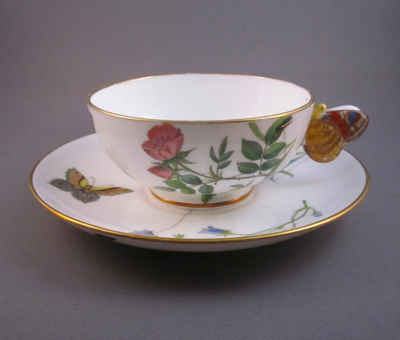 This delicate English porcelain bone china cup and saucer each have a transfer decoration of butterflies and flowers with hand painted washes of color. 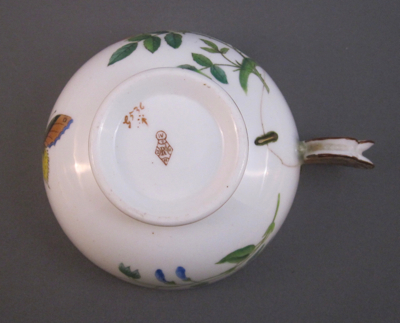 The figural butterfly handle, though lovely to look at, makes for an unsteady grasp on a steaming hot cup of tea. 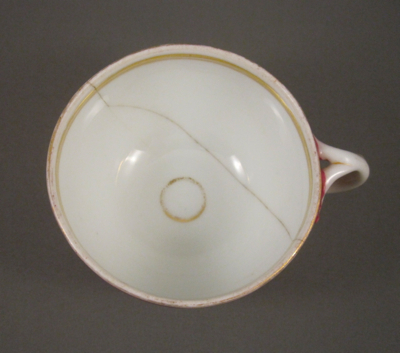 Perhaps that’s how both the cup and the saucer met their early demise and ended up crashing to the floor, breaking into many pieces. 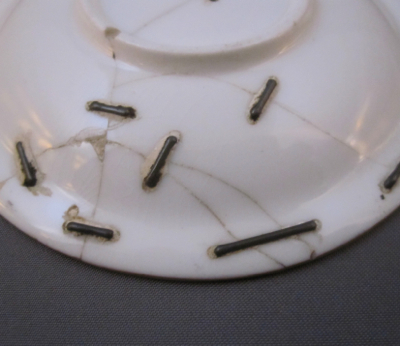 But luckily a local china mender was standing by with drill and staples at hand, and able to join together the broken pieces. 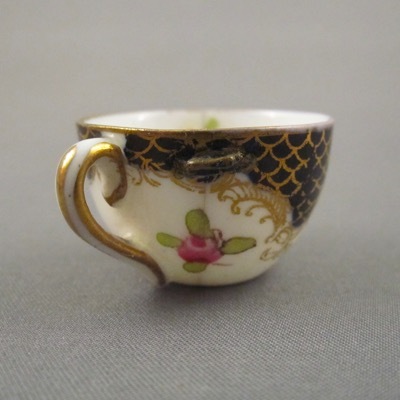 Six tiny brass staples were carefully attached, three on the cup and three on the saucer, allowing the tea to flow once more. 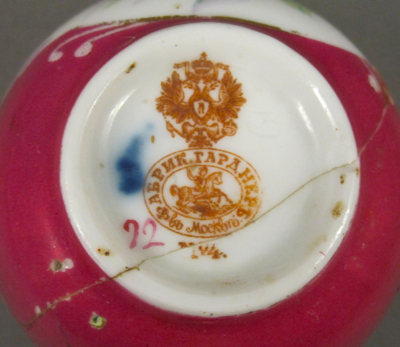 Marked on the underside of the cup, which measures 1-3/4″ high, is an English registry cypher, dating the piece to April 7, 1869. 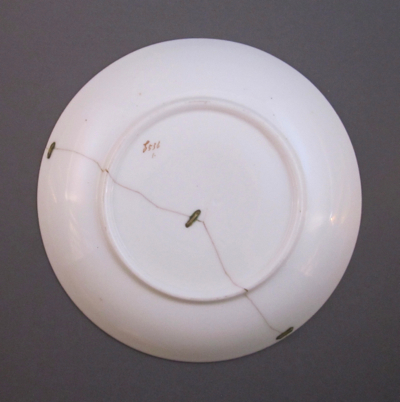 The saucer, with a diameter of 5-1/2″, has a faint impressed MINTON mark. 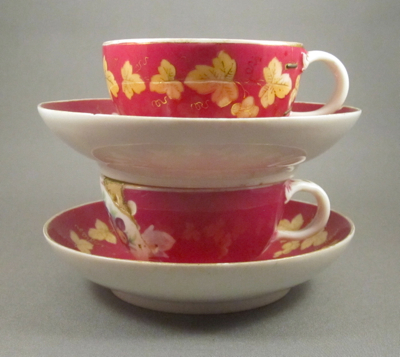 To celebrate the conclusion of my work on Season 2 of The Americans, a television show on the FX network set in 1982 about a pair of Russian spies living as Americans in Washington, D.C., I am posting this pair of Russian tea cups and saucers. 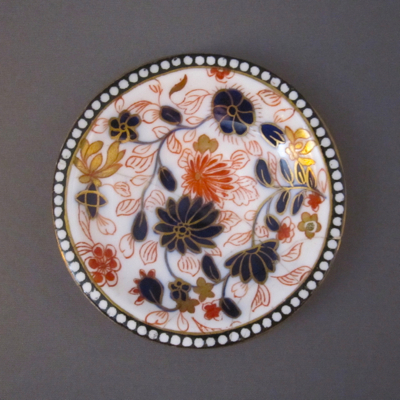 They were made by the Gardner factory at the turn of the 20th century and are decorated with gold leaves, and hand painted flowers in white medallions, set against a deep red ground. 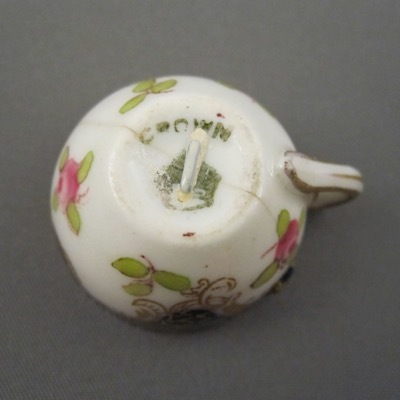 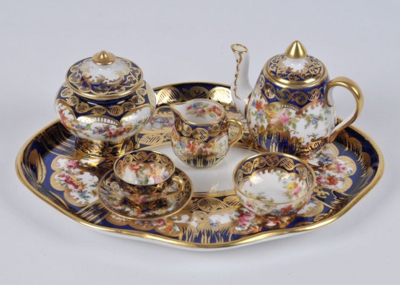 They are part of a larger tea set, many of which were exported to the Turkish Empire and Central Asia. 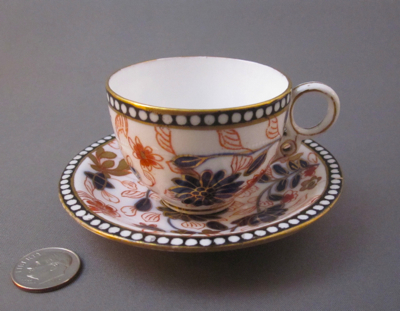 The cups measure about 2″ high, with an opening of 3-1/4″, and the saucers have a diameter of 5-1/4″. 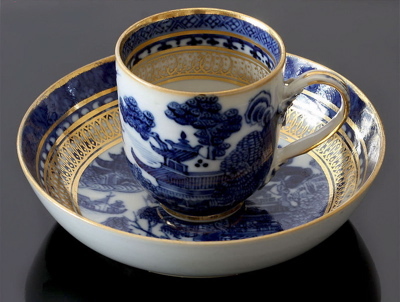 Both cups were broken and repaired by a china mender in the early to mid 1900s, after Sascha dropped the entire tea service while entertaining Anastasia and Vladimir. 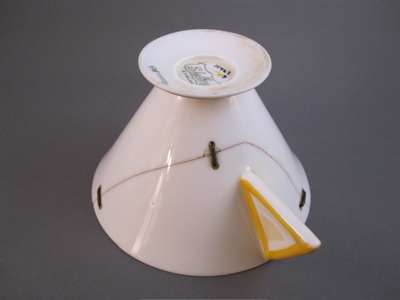 неуклюжая девочка! 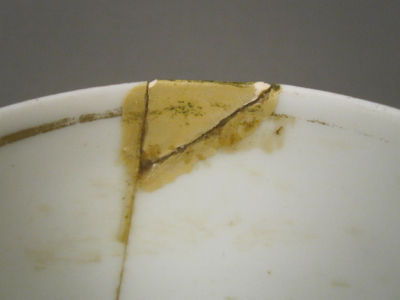 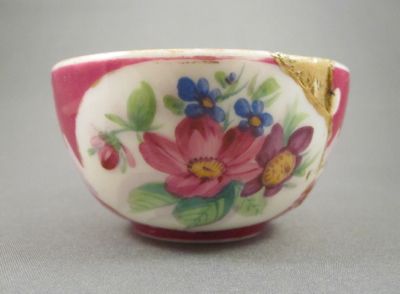 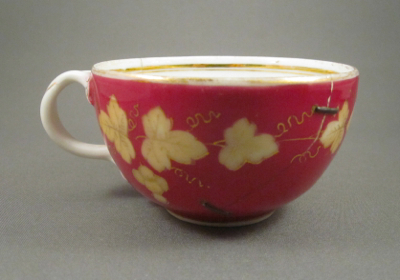 Cup 1 (top) with gilt leaf decoration, has hand cut metal staples that still hold the two broken pieces tightly together. 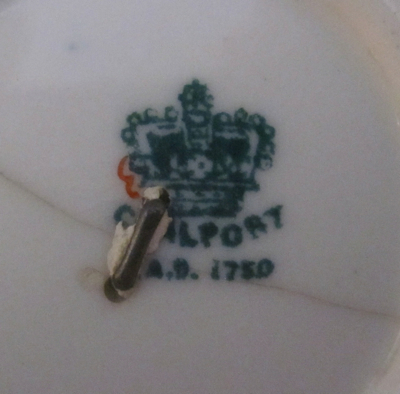 It has a factory mark stamped in red on the underside. 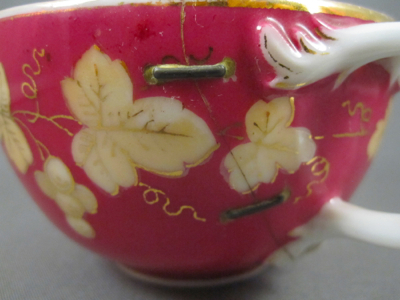 Cup 2 (bottom) has a yellowed replaced chip, possibly from another cup. 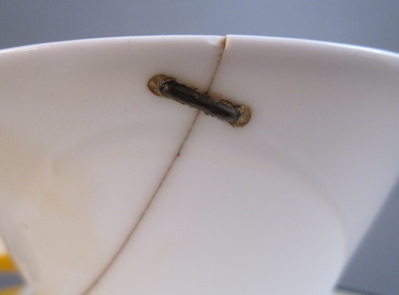 Once repaired with metal staples, the cup is now held together by a sloppy glue job, although the empty staple holes are still visible. 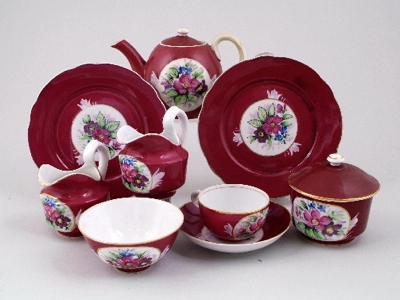 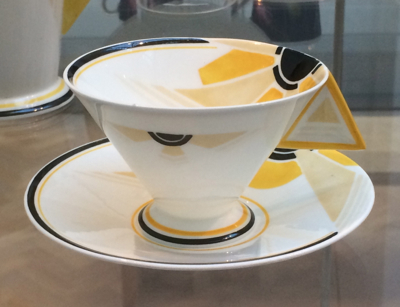 This partial tea set was also made by Gardner and includes a cup and saucer much like mine. 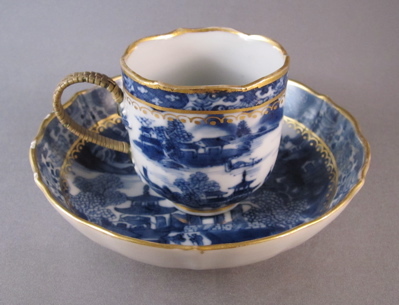 A delicate Imperial Nanking porcelain cup with matching saucer, decorated in cobalt blue underglaze with gilt overglaze trim. 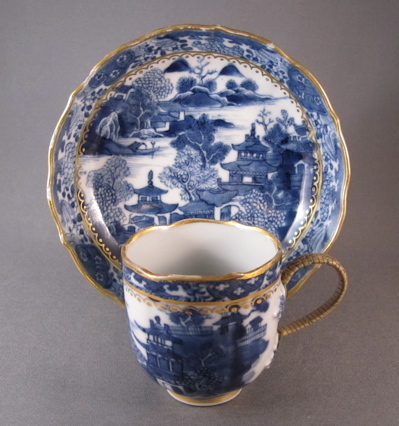 Both pieces have a scalloped rim and were made in China for export to Europe and North America in the early 1800’s. 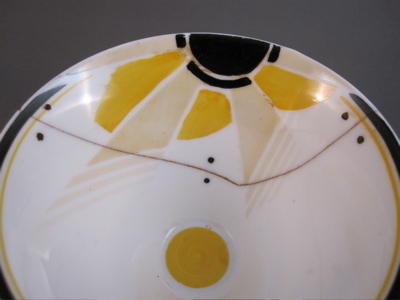 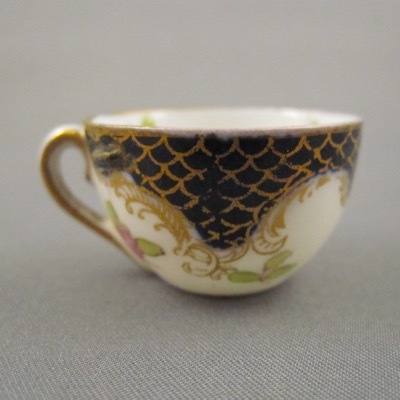 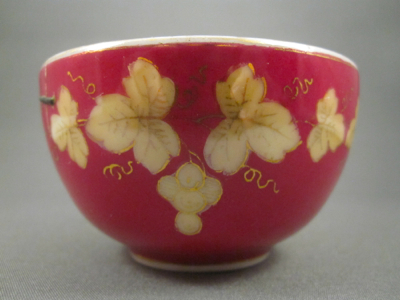 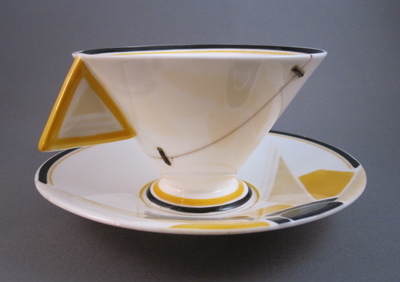 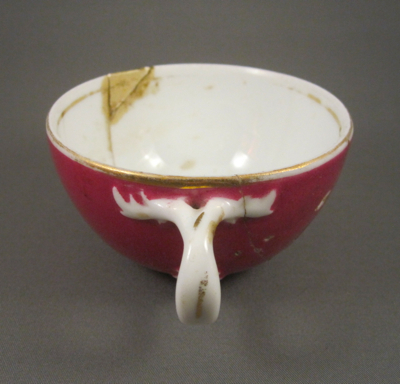 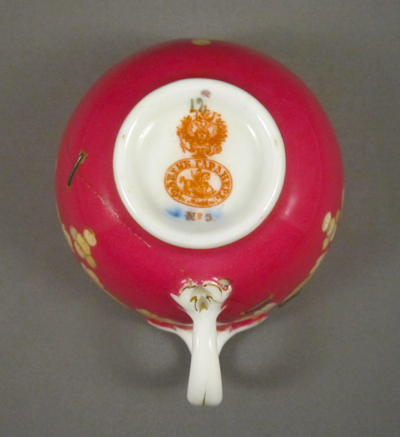 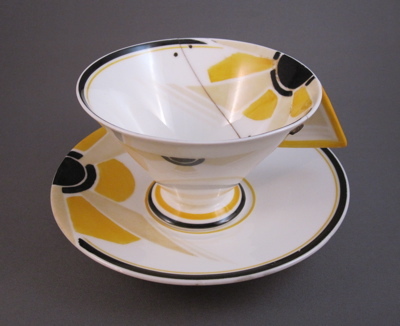 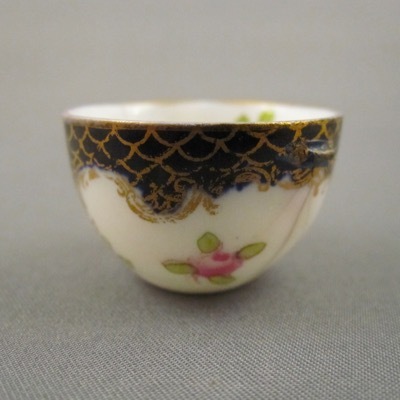 The cup measures 2-1/4″ high, with a diameter of 2-1/4″ and the saucer has a diameter of 5″. 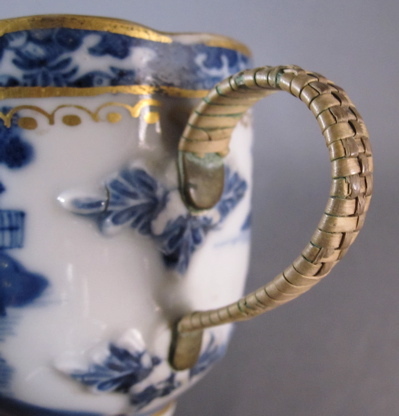 When the lapped reeded handle broke off nearly 160 years ago leaving just the leaf terminals, a skilled metalsmith forged a bronze handle and covered it with woven rattan. 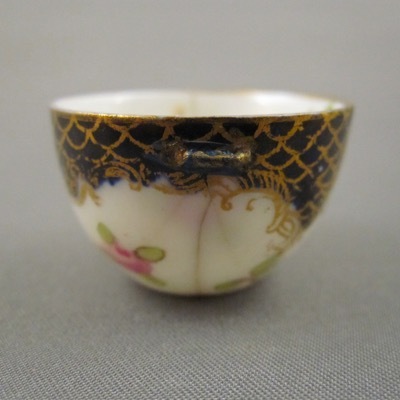 The original handle on my cup would have looked like the one on this cup of similar form and decoration. 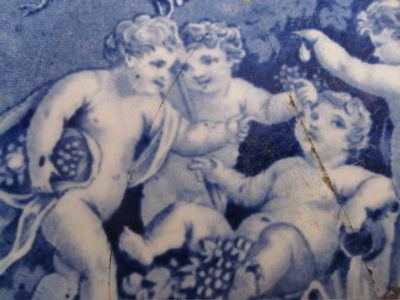 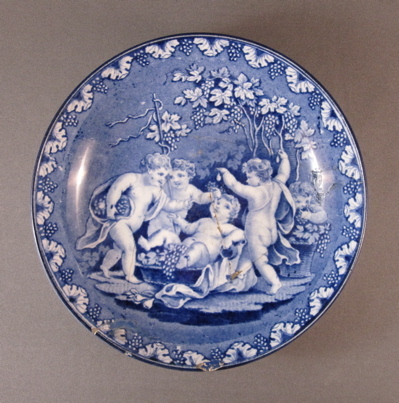 Blue & white transfer printed pearlware pottery saucer, showing a group of inebriated cherubs picking grapes. 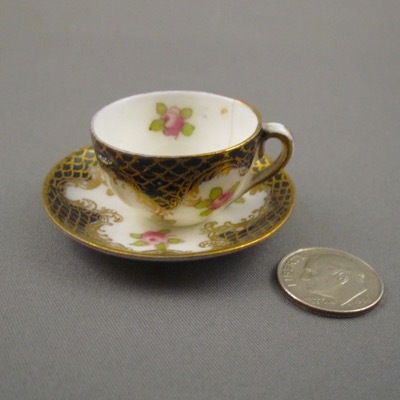 Measures 4-3/4″ in diameter. 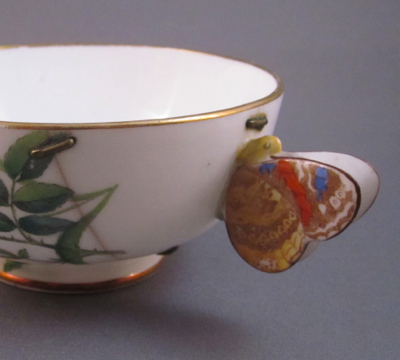 Made in England by Patterson & Co. in the early 19th century. 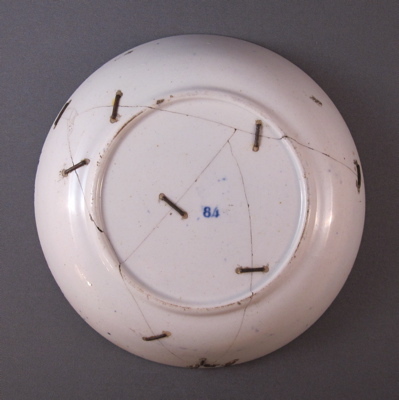 Marked on the bottom with the number “84” in blue, but without a maker’s name. 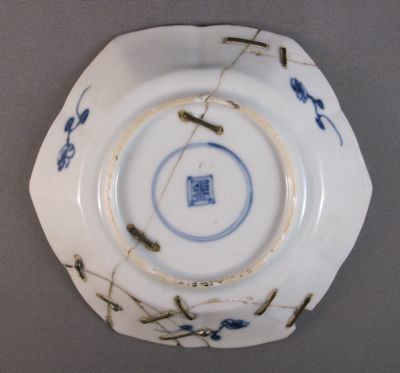 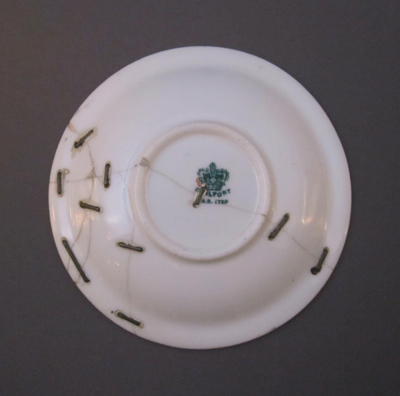 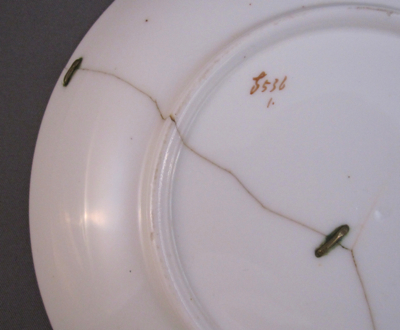 Saucer was repaired in the 19th century and is now held together with one dozen metal staples, including some of the smallest examples I have ever seen at 3/8″ long. 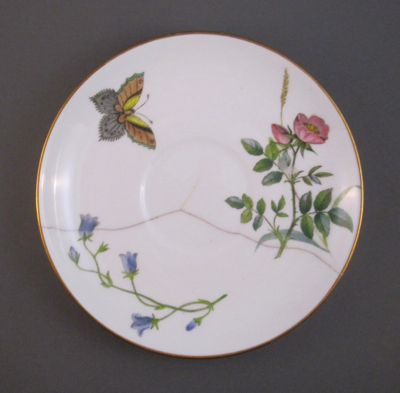 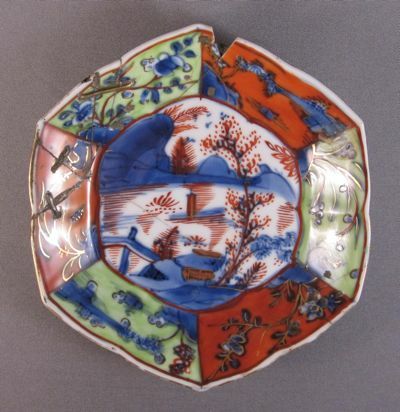 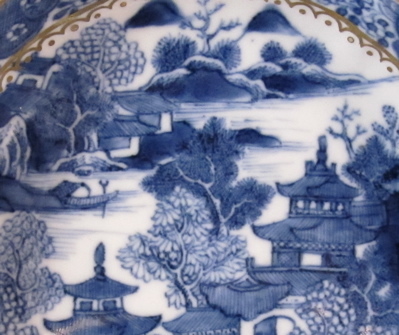 This Chinese porcelain hexagonal shaped saucer began life in the late 1600’s simply decorated with blue underglaze, but was later clobbered (painted over) in the mid-1700’s in more “attractive colors” to the taste of the day. 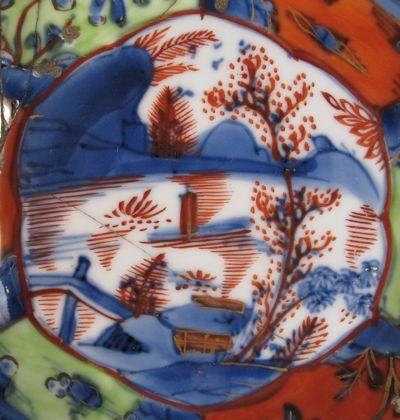 The original blue underglaze decoration was “improved upon” with the addition of arbitrarily painted red and green overglaze, most likely in Amsterdam. 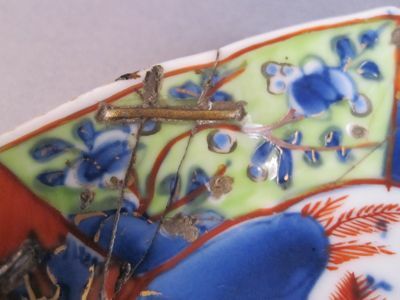 This small gem, which measures 4-1/2″ in diameter, has 14 metal staples holding the once shattered saucer intact, more staples per square inch than any other example I own. 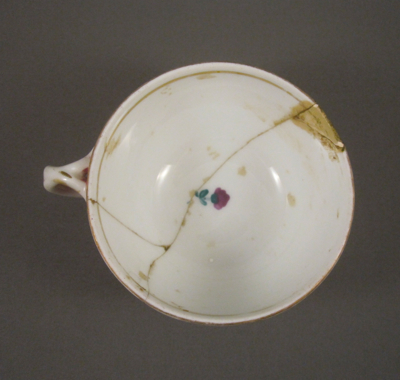 A matching cup, also held together with many staple repairs, was unfortunately lost during a move to Florida. 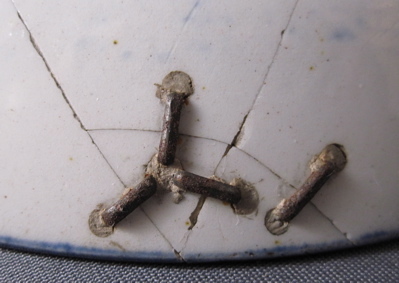 There are 11 iron staples on the back of the saucer and 3 staples (2 iron and 1 brass) on the front.